It had to happen eventually, and now it has. 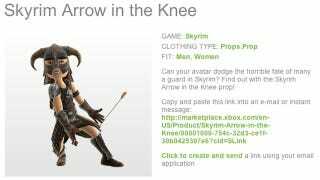 Among the many new Xbox Live avatar costumes that Bethesda released today is one that takes the meme to end all memes to its logical conclusion. Yes, for a mere 240 Microsoft points, your avatar can injure him or herself in the best, most Skyrimmy way possible. I think I am actually going to buy this.